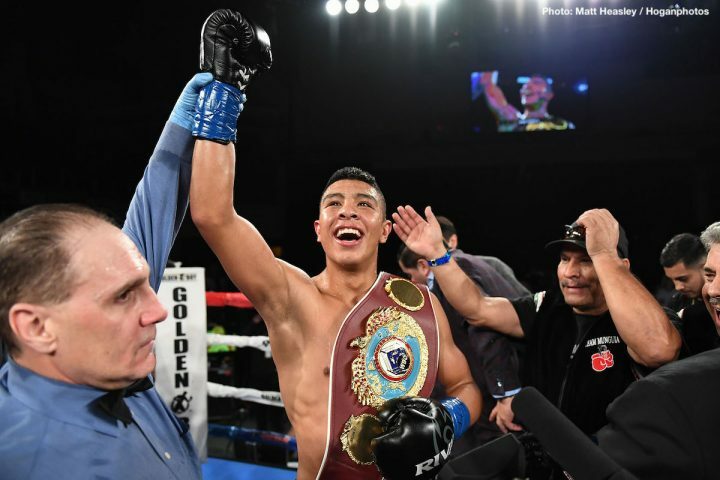 By Jim Dower: Promoter Frank Warren is reporting that the fight between WBO junior middleweight champion Jaimie Munguia (29-0, 25 KOs) and Liam Smith (26-1-1, 14 KOs) is a done deal for July 21 at a still to be determined venue. Warren says the Munguia-Smith fight could take place in Los Angeles or New York. He says he’s hoping to find out what the location of the fight is by today. “Liam Smith fight is done,” Frank Warren said to IFL TV about the Jaime Munguia vs. Liam Smith fight for July 21. “I just got to find out about the venue, which is on the 21st of July. It’s a big fight for Liam. It’s a tough fight for him, but he’s capable. We just got to get the venue sorted out. Hopefully I’ll know that today. I’m hoping it’ll be in LA or in New York. Wherever it is it is. I just want to get it on.” Warren said. This is a tough match-up for the 29-year-old Smith to be taking, because Munguia will have all the advantages in this fight. He’s younger, stronger, and faster and he’ll be fighting at home in front of a large crowd. If Smith is lucky, the fight will take place in New York City where the British fan base will be larger, but with Munguia’s punching power, it probably won’t matter. Munguia destroyed Brooklyn native Sadam Ali in front of his own fans last month in Verona, New York. It didn’t matter that Sadam had the boxing fans on his side in that contest. Munguia jumped on Sadam in the 1st round and immediately dropped him. Before the round was over, Sadam was knocked down twice and came close to being stopped. Smith does a good job of covering up and waiting out his opposition until they grow tired of hitting him. I don’t think that’s going to work against a beast-like puncher like Munguia. By the time he grows tired of hitting Smith in the head with power shots, the fight will be long over. Munguia hits way too hard for Smith to play possum on July 21. Smith’s only chance of winning the fight is to come out fast looking to slug it out with Munguia in hopes of beating him at his own game. “I just hope the scoring is better this time around,” Warren said about the Canelo vs. GGG rematch. Warren’s fighter WBO middleweight champion Billy Joe Saunders missed out on a title shot against IBO/WBA/WBC middleweight champion Gennady Golovkin after he chose to face Saul Canelo Alvarez in a rematch on September 15.